CARFAX Certified 1 Owner - No Accidents - Fully Serviced - QUALITY CERTIFIED up to 10 YEARS 100,000 MILE WARRANTY This Mercedes-Benz includes: DESIGNO ESPRESSO BROWN, DESIGNO EXCLUSIVE NAPPA LEATHER Leather Seats WOOD/LEATHER STEERING WHEEL Steering Wheel Audio Controls Leather Steering Wheel LUNAR BLUE METALLIC LIGHTING PACKAGE HID headlights Headlights-Auto-Leveling PREMIUM PACKAGE HD Radio Navigation System CD Player AM/FM Stereo Satellite Radio Power Door Locks Keyless Entry Auxiliary Audio Input Hard Disk Drive Media Storage MP3 Player PARKING ASSIST PACKAGE Automatic Parking Back-Up Camera DRIVER ASSISTANCE PACKAGE Lane Departure Warning Lane Keeping Assist Brake Assist Adaptive Cruise Control Blind Spot Monitor Cross-Traffic Alert HEATED FRONT BUCKET SEATS (STD) Power Passenger Seat Power Driver Seat Heated Front Seat(s) Driver Adjustable Lumbar Bucket Seats BRUSHED ALUMINUM RUNNING BOARDS Running Boards/Side Steps REARVIEW CAMERA Back-Up Camera RADIO: COMAND SYSTEM W/NAVIGATION HD Radio Navigation System CD Player AM/FM Stereo Auxiliary Audio Input Hard Disk Drive Media Storage MP3 Player *Note - For third party subscriptions or services, please contact the dealer for more information. 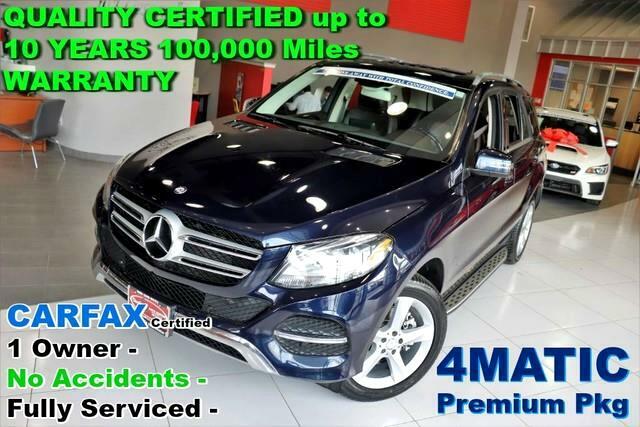 * The CARFAX report shows this Mercedes-Benz GLE is a well cared for One-Owner vehicle. Perfect for the on-the-go family, this Mercedes-Benz GLE GLE 350 is an SUV everyone will love. With exceptional mileage, options and power, you'll insist on driving it on all your outings. Is it possible to fall in love with a vehicle? It is when your vehicle is as prestige as the Mercedes-Benz GLE. Take home this 2016 Mercedes-Benz GLE and enjoy the safety and added performance of AWD. Low, low mileage coupled with an exacting maintenance program make this vehicle a rare find. Marked by excellent quality and features with unmistakable refined leather interior that added value and class to the Mercedes-Benz GLE Left your phone at the restaurant? No problem. With the navigation system on this Mercedes-Benz GLE, you'll be able to quickly find your way back to get it. Knowledge is power and with the complete records of this pre-owned vehicle, you'll have the power to make a wise purchase. If you are looking for a pre-owned vehicle that looks brand-new, look no further than this Lunar Blue Metallic Mercedes-Benz GLE. Get more for your money with this well appointed vehicle, including a factory warranty. Fast and exciting, this Mercedes-Benz GLE GLE 350 is a true testament to the pursuit of automotive distinction by Mercedes-Benz. Once you're behind the wheel of this incredible machine, you will not think twice about purchasing this vehicle. You demand the best in everything, so why would your automobile be any different? Enjoy the best features available in this stunning Mercedes-Benz GLE. The paint and body on this Mercedes-Benz GLE GLE 350 looks as fresh as the day it rolled off the assembly line. The Mercedes-Benz GLE GLE 350 is exactly what you would expect out of a Mercedes-Benz. It's decadently opulent, meticulously engineered and unapologetically grandiose. Equipped with optional wheels. More information about the 2016 Mercedes-Benz GLE: The GLE is a mid-sized luxury SUV that competes with vehicles such as the BMW X5 and the Audi Q7. Starting at around $52,000, the GLE comes in a large variety of different flavors, offering everything from a relatively fuel efficient diesel, to a 500+ horsepower. Quality lives up to the usual Mercedes high standards with doors that close with a satisfying clunk and a general feeling of vault-like security. It all goes towards giving the GLE the luxurious look and feel that Mercedes is well renowned for. Strengths of this model include available coupe body style, ridiculous horsepower when properly optioned, available diesel engine, Attractive packaging, all-wheel drive, and luxurious amenities No Credit / Bad Credit / No Paystubs, No problem !! ! All Approved ! Everyone drives ! CLEAN, GORGEOUS, LOW MILES, SHOWROOM CONDITION. CALL NOW QUALITY CERTIFIED up to 10 YEARS 100,000 MILE WARRANTY , To Certify a vehicle, there will be an additional cost for Certification. CALL NOW For details. STUNNING AGGRESSIVE LOOK ON THIS BEAUTIFUL--Call today to schedule a test drive... Good Credit/Bad Credit/No problem!!!! Get paid cash? No problem!! 100% Credit Approval with interest rates starting at 2.49% for qualified customers, our rates will not be beaten. We price our cars at wholesale price to guarantee the best deals for our customers. Our inventory moves quick, please call to confirm the availability of the vehicle of your interest Springfield location 973-564-0112. This vehicle is located at our SPRINGFIELD location. Come visit our new showroom in Springfield NJ. This 2016 Mercedes-Benz GLE GLE 350 is proudly offered by Quality Auto Center The Mercedes-Benz GLE GLE 350 offers a fair amount of utility thanks to its advanced features and unique styling. It's also quite sporty, and injects an ample amount of handling chutzpah into the ridin'-high body of a family-friendly SUV. There's a level of quality and refinement in this Mercedes-Benz GLE that you won't find in your average vehicle. Enjoy the grip and control of AWD performance in this nicely equipped Mercedes-Benz GLE. Exceptional in every sense of the word, this incredibly low mileage vehicle is one of a kind. More information about the 2016 Mercedes-Benz GLE: The GLE is a mid-sized luxury SUV that competes with vehicles such as the BMW X5 and the Audi Q7. Starting at around $52,000, the GLE comes in a large variety of different flavors, offering everything from a relatively fuel efficient diesel, to a 500+ horsepower. Quality lives up to the usual Mercedes high standards with doors that close with a satisfying clunk and a general feeling of vault-like security. It all goes towards giving the GLE the luxurious look and feel that Mercedes is well renowned for. Strengths of this model include available coupe body style, ridiculous horsepower when properly optioned, available diesel engine, Attractive packaging, all-wheel drive, and luxurious amenities No Credit / Bad Credit / No Paystubs, No problem !! ! All Approved ! Everyone drives ! CLEAN, GORGEOUS, LOW MILES, SHOWROOM CONDITION. CALL NOW QUALITY CERTIFIED up to 10 YEARS 100,000 MILE WARRANTY , To Certify a vehicle, there will be an additional cost for Certification. CALL NOW For details. STUNNING AGGRESSIVE LOOK ON THIS BEAUTIFUL--Call today to schedule a test drive... Good Credit/Bad Credit/No problem!!!! Get paid cash? No problem!! 100% Credit Approval with interest rates starting at 2.49% for qualified customers, our rates will not be beaten. We price our cars at wholesale price to guarantee the best deals for our customers. Our inventory moves quick, please call to confirm the availability of the vehicle of your interest Springfield location 973-564-0112. This vehicle is located at our SPRINGFIELD location. Come visit our new showroom in Springfield NJ.